This year I didn't have great luck with tomatoes, due to wetness, but I did try a new veggie, because I am always looking for something to replace summer squash, since I can't grow that, and most other squash, due to squash vine borer. I didn't even know if Bottle Gourds would be prone to SVB; I've had other Asian squash come down with it. But it didn't, and the two plants I had grew like they were on steroids, at least early on. The best were around 12-15 inches, but I had a couple to over 30"! Here's a photo of two of them, before and after cutting down the center. They were firm, and still not seedy until well over 20". 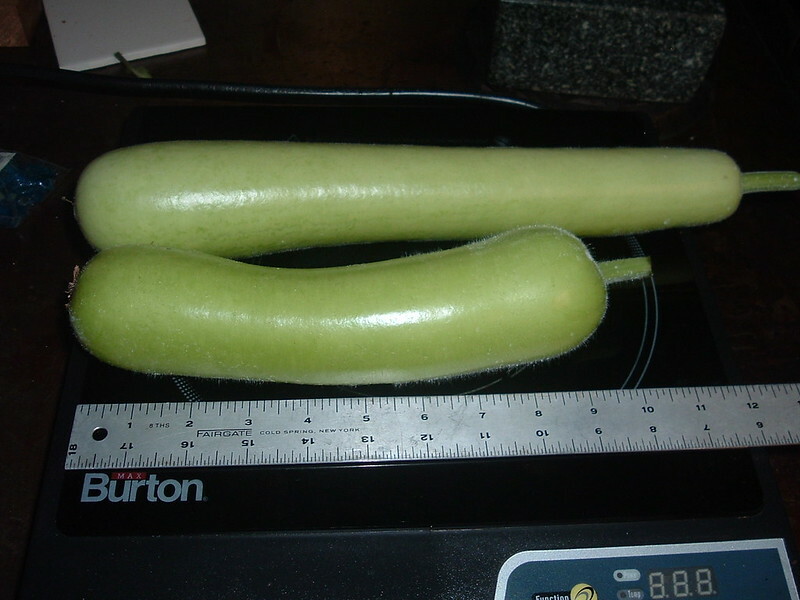 These look like 5" zucchini, which get much seedier, past about 6". These are normally found in Asian markets, more often Indian. They don't get mushy, even after 15 min. of cooking. 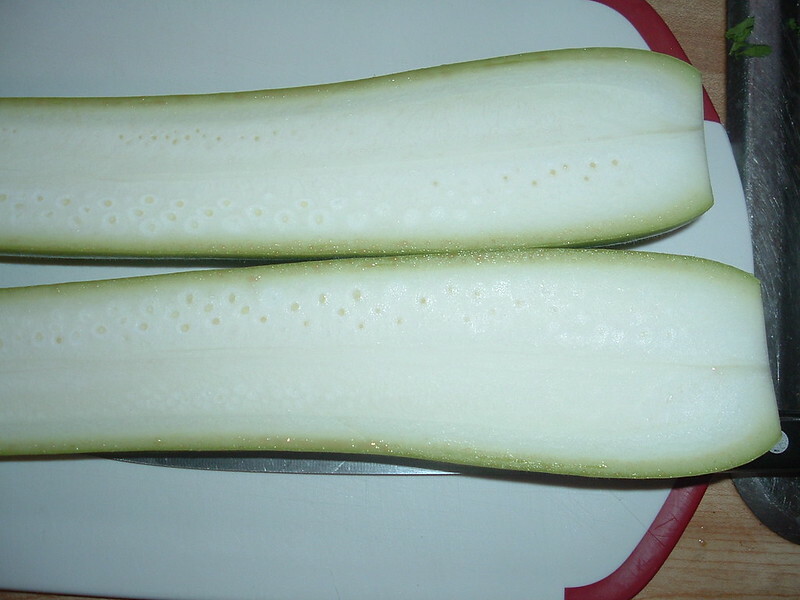 I have used them in many zucchini recipes, with great success. I tried so dehydrate them when I had huge numbers of them, but it didn't work well, as they have even more water than eggplant. However, they made good chips, sliced very thin, and dried out at about 170º, to slightly brown them. Next season I'll just plant one, then 4 weeks later, plant another, so I won't get them all at once. I got two new peppers that are keepers, the most noticeable one the Aji Dulce. This is a variety that I tried years ago, but it was very late, and non-productive. However, they have improved almost all habanero type peppers through the years, plus, I am growing them in the Earthboxes, so I tried them again. What makes them notable is that they have an intense habanero flavor, but almost no heat - Maybe 500 SUs, or less! This has been useful for making mild dishes with habaneros, so those who can't take the heat, can enjoy that incredible flavor. I also made some milder habanero gingersnaps. Here is a bowl of them, showing the intense red color, and another photo of a rack ready for the dehydrator, all of which came from one plant. The other pepper I will grow again is the jyoti - an Indian pepper, sort of like a Thai pepper, but longer, and milder, only 30-40k. Incredibly productive, and good when used fresh green or dried red. Also froze a bunch fresh red, for Thai dishes. Already getting my new seeds for next season! As I told somebody recently, I do miss all those veggies in the off season, but I don't miss the heat! As always, I'm willing to swap you wine or other things for mild dried peppers.